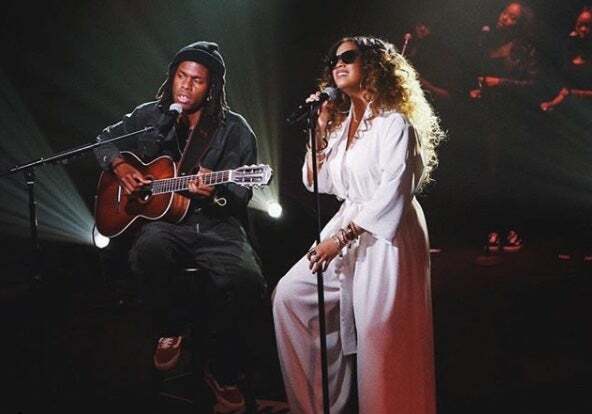 Just days after the two performed on Jimmy Kimmel Live, Daniel Caesar brought out H.E.R. to perform “Best Part” during his set at Coachella on Friday. Fans of the Toronto R&B artist showed their excitement as H.E.R. took the stage to help perform the second single from his Grammy-nominated debut album, Freudian. The duo, who are both performing at the 2018 ESSENCE Fest this summer, also released a video for the song this week. Set on a beach at different times, it shows Caesar and H.E.R. walking towards each but unable to connect. If you couldn’t make it to Coachella, be sure to grab your tickets to see Daniel Caesar and H.E.R making their ESSENCE Fest debut in New Orleans this July!